“How can you give him up?” That’s the first thing most people say when I tell them that my puppy belongs to the charity Canine Partners and will live with me for the first year of his life. Then, all things being equal, he will go off to advanced training to be matched and trained with a person with disabilities. He will then go home with them to transform their life. The trite answer is “they will give me a shiny new one”, which is true but there is so much more to it than that. Yes! 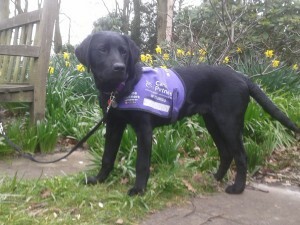 I go through the heartache of giving up the puppy that has lived with me, played with me and gone everywhere with me but the more people I get to know in the “purple army”, as we like to call ourselves, the more I realise that the charity’s strap line “Amazing Dogs Transforming Lives” is exactly what is happening. It is a very different heartache to the one I went through when my pet dog died last year – we send these puppies off to ‘Uni’ knowing that they are going on to live fulfilled and happy lives. I am making a big commitment for a year each time but not for the 15 years I would be committing to for a dog of my own. As a volunteer Puppy Parent for Canine Partners I am given a 6 to 8 week old puppy and the charity provides his food, arranges foster care if necessary, and oversees and pays for his veterinary care. My side of the bargain is that I take him everywhere with me and socialise him, take him into shops, restaurants, pubs, on buses and trains, in fact anywhere he is likely to need to go once he is out working. As a trainee assistance dog he is allowed to go where pet dogs are not welcome. We also have lots of fun doing the things that all young puppies like to do. I take him to class at Writtle once a week and we have regular meetings with our Essex Satellite Trainer who helps to make sure that all the puppy’s habits are good ones. The main things that I have to teach are good manners, heelwork, retrieve, touch and tug. Once he is in advanced training his full time trainer will develop this into all of the tasks that his new partner may need such as opening and closing doors, picking up dropped items, pulling them up in bed, getting dressed and undressed, pressing an alarm button and putting the washing in and out of the machine. There is a great camaraderie amongst our purple army brought about by us all working towards a common goal and enjoying the company of these gorgeous puppies in the process. The puppy that I have at the moment is called Fabio. All these years of dreaming of Fabio with dark wavy hair and deep brown loving eyes and this is what I got. Be careful what you wish for! Click on the links below to see current volunteering roles with Canine Partners.